It’s barely summer — we know — but it’s never too soon to start thinking about the kinds of interactive marketing campaigns you’re going to build for the holidays. In fact, now is the perfect time to get your holiday marketing plans in order. Today’s post, which highlights a company that ran two multi-day giveaway posts last December, might just inspire you. 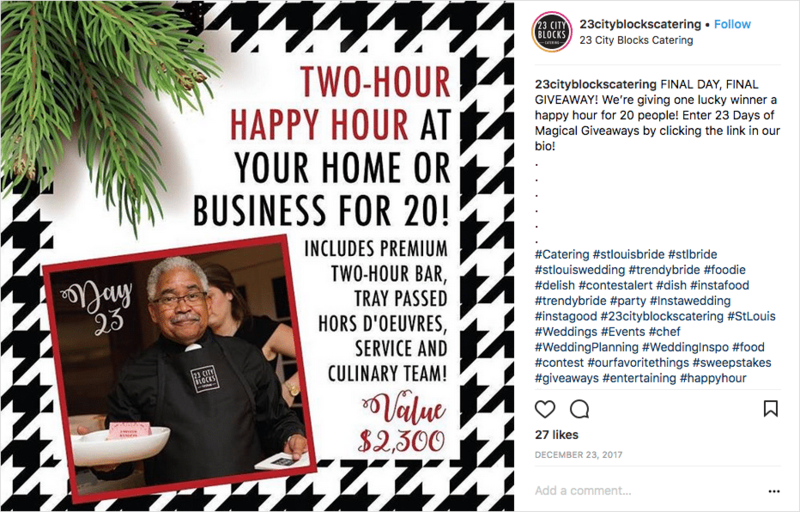 23 City Blocks Hospitality Group is a company that operates a restaurant, two event spaces and a catering business. The company is based in St. Louis and is a beloved wedding and event planner. 23 City Blocks’ various brands are known for their artistic visions for events and their use of local ingredients in recipes. Bradham-Little executed both campaigns flawlessly. At the same time. During the holidays. Obviously November and December are typically very busy times for restaurants and caterers, so we bow down to her! Bradham-Little picked a template she liked and duplicated the campaign so she could get double the use out of it, saving herself a ton of time. “We wanted templates that allowed multi-day giveaways but were really clean,” she says. 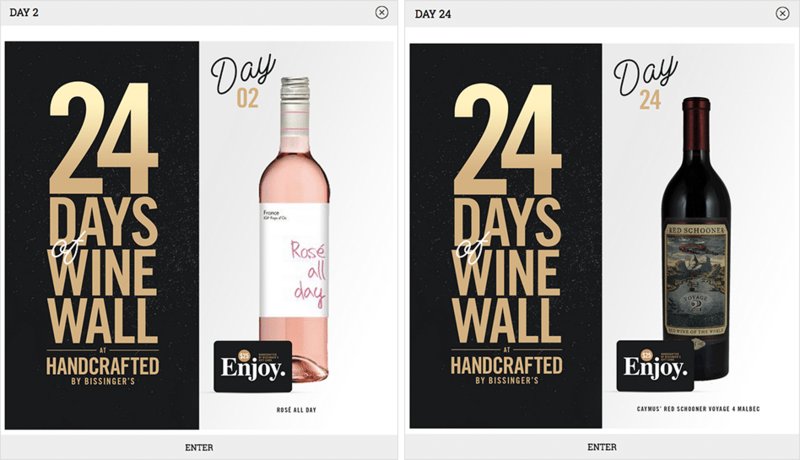 “I didn’t want to clutter up what could also be considered a confusing set of campaigns.” By using ShortStack’s template, she was able to quickly brand each giveaway, saving herself and her team a lot of time. When it comes to giveaways, one of the most important decisions a brand can make surrounds the prize(s). Lots of brands make the mistake of thinking they must give away something very expensive in order to drive the engagement and bring in the entries and leads they want. For each campaign, Bradham-Little wanted prizes that were focused on entertaining and culinary concepts. 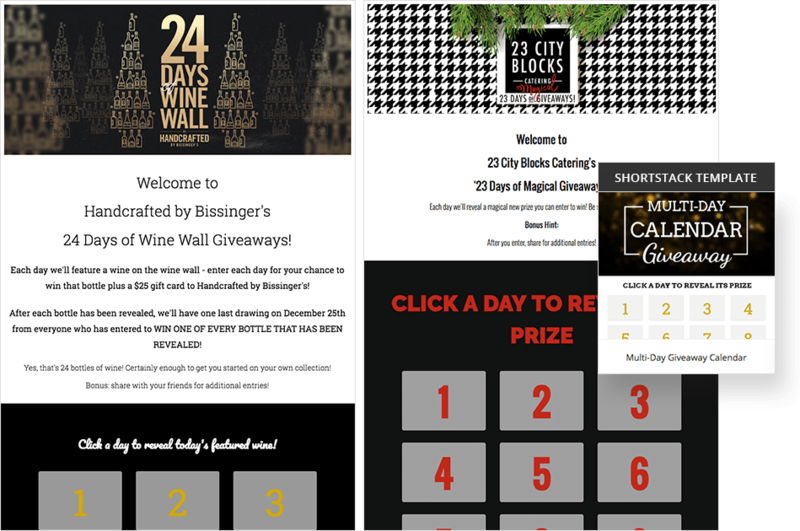 Since the cafe/wine bar, Handcrafted by Bissinger’s, features a “wine wall” with 24 self-serve wine taps, she decided to do a daily giveaway featuring one each of the bottles the cafe was featuring in December; the grand prize was a package containing all 24 bottles. For the catering side of the business, the goal was to highlight equipment and tools used in catering and entertaining. “They were items you might not have heard of, or ones you wish could splurge on but never did,” Bradham-Little says. “I scoured top gift-giving guides, top wedding-registry items and of course, things I personally would love to have or win.” She also wanted the items to have a high perceived value, making it worth the time to enter and share the contest on social media. When building the campaign, “I wanted the experience to ride like a rollercoaster,” she says. Not every day could feature a “big prize” so to keep engagement consistent, Bradham-Little started out strong but then intermittently introduced less expensive items, culminating in the grand finale prize which was a catered party for 20. “A good number of people came back every day to enter again, for as long as the campaigns were running,” she says. On this campaign, each day was a surprise with larger prizes scattered throughout. Over the years, we’ve studied thousands of campaigns to see what makes some more successful than others. Obviously there are some key factors — like offering the right prize — but in the last couple of years, we’ve noticed two things that make contests and giveaways catch the attention of their targeted audience. First, running campaigns on a consistent basis — approximately once per quarter — brings in many more leads than one-off campaigns. And two, embedding campaigns on a brand’s website, rather than running them on a social platform like Facebook, allows brands to have more control over the content and other important elements of the giveaway. The result: more views, more entries, more opportunities to focus people’s attention on your website and show them what is more important to you. “It seemed like a waste of time and money to not embed the campaigns and drive traffic to our websites,” says Bradham-Little. (And we know what happens when brands keep their campaigns on their own properties — they get more traffic and collect more leads.) She was thrilled with her results: “Handcrafted by Bissinger’s brought an 86 percent increase in website traffic, plus we got 279 new Facebook page likes and 100 new Instagram followers,” she says. 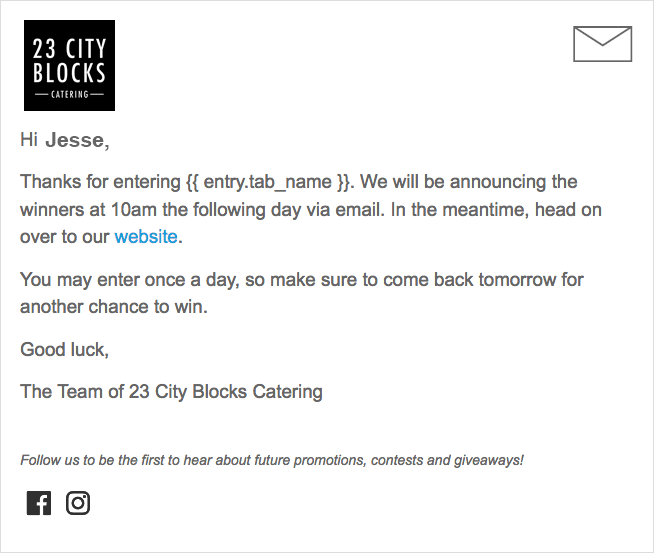 Over at 23 City Blocks Catering, there was a 142 percent increase in website traffic, 189 new Facebook likes and 24 new Instagram followers. We’ve preached for a very long time that a campaign is only as successful as its promotion. Hashtags are all the rage these days. And some brands have figured out how to make them extend exposure to their campaigns and to their brand. Once again, the team at 23 City Blocks has it figured out. For each of the campaigns, Bradham-Little used a combination of popular, unique and local hashtags. For each of the campaigns, Bradham-Little used a combination of popular, unique and local hashtags. Bradham-Little isn’t shy about her love for hashtags, “#IWouldWriteInThemIfPeopleWouldntKillMe,” she says. “I know some of the tags I use pull from outside my target market, but I’m okay with that,” she adds. “They’re useful and they’re fun.” Bradham-Little spent $600 per campaign for ads that ran on Facebook and Instagram. “I booked two weddings and one corporate event from people who entered the contest,” she says. The ads and the investment she made in her prizes more than paid for themselves. Bradham-Little made use of ShortStack’s marketing automation and email marketing features. She sent everyone who entered a “thank you” email, and has used the lists in subsequent email marketing campaigns. “The features were especially useful for Handcrafted by Bissinger’s,” she says. “And even though the catering and wedding market is a little more fluid, since there is always a new crop of recently engaged couples, I’m sure some of the people who entered will be life-long fans of our restaurants and products, and now I have a way to stay in touch with them,” she says. To read how other ShortStack users have had success using the platform, browse our Customer Success stories.